Hook and clip ends for post ropes in a variety of finishes. The open hooks or the easy-release snaps will not pull free. 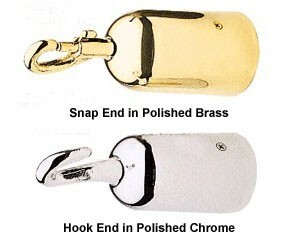 Finishes are: polished chrome, satin chrome, polished brass with ultra-coat and satin brass. The ends are factory installed and it is necessary to order two for each rope chosen. Hook and clip ends for post ropes. Available in four finishes. They are factory installed: order two for each rope selected.